A child’s birthday party has the potential to be a very special time, the happiest and one of the most memorable days in their life. Most adults can still recall a special birthday they had as a child, which is why parents try to make their own child’s birthday a special day to remember, so they will also have cherished memories in the future. As a parent, one of the toughest things to prepare for is the theme of the birthday party, something special, unique, and that will be memorable. If you want to create a birthday party that will never be forgotten, a party like no other, exciting, unique, interesting, educational, and fun, then you are in luck because it is possible to have a birthday party with animals! It’s true, you can hire animals as mascots and create a “nature” theme for your child’s party. Black Snake Productions can supply an interactive and educational wildlife presentation that features animals native to Australia, such as lizards, snakes, owls, and other animals that children can safely touch. A birthday party that includes animals is guaranteed to be a day to remember because children are naturally curious about nature and animals, and when children at the party are allowed to touch and interact with various types of animals, it creates a very exciting atmosphere for everyone – adults and children. No matter the venue, your home, school, park, or a rented hall, Black Snake Productions can deliver a one-of-a-kind wildlife presentation that get everyone’s attention, and place the birthday celebrant as the star of the show. The birthday boy or girl will have the opportunity to be the first one to get close to the animals, touch them, feed them, and even hold them under the direct supervision of the animal handlers. The rest of the party guests will have their turn later, but the birthday kid is assured to extra attention. 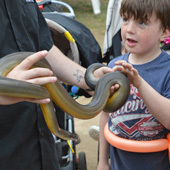 For over 10 years, Black Snake Production has been providing exciting, fun, educational, and interactive parties and presentation for children and adults using various kinds of friendly animals.